Carhartt WIP: Few other brands have had an influence on European streetwear quite like Carhartt WIP. Their timelessly clean styles have pushed them to become an icon of European streetwear. Alongside Levis and Dickies, brands like Carhartt WIP are the founders of the latest fashion and streetwear trends today. Carhartt was founded in 1889 in Detroit by Hamilton Carhartt, who made overalls for American railroad workers out of denim and canvas. Both fabrics would go on to become absolute staples in their future collections. The company that started out with four sewing machines and five employees turned into one of the most famous workwear companies of all time. The label invented an extremely durable, 100% cotton/canvas blend and called it “cotton duck”, or just duck for short. This duck canvas is used on multiple Carhartt products and in many of their collections to this day. Carhartt was purely a classic American workwear company for a long time. The Work in Progress (WIP) Textile Company, whose HQ is in Switzerland, bought the rights to the Carhartt name within Europe in 1994. In America, products like the Carhartt Watch beanie were doing very well in the late 90s. Using their new name’s full potential, Carhartt WIP started selling products that mimic the American Carhartt’s style and attitude, but in a cooler, younger way that was accessible to European customers. Borrowing ideas and inspiration from the American Carhartt label, Carhartt WIP founded an “urban streetwear” label with the same name. They quickly grew in popularity and became associated with European skateboarding, hip hop and street art. Rumor has it that Carhartt WIP hasn’t fired any employees in the past 26 years. Whether that’s true or not, the kindness and loyalty of their boss, Edwin Fäh, deserves an honorable mention. In an interview with a Swiss magazine, they asked Fäh if having a healthier life was more important to him than business, to which he agreed. That should speak for itself. The first product line designed specifically for Europe was released in 1997. Original Carhartt workwear silhouettes were reinterpreted for the active lifestyles of urban youth, true to Carhartt’s core values: excellent design, above average quality, durability and comfort. That’s how authentic Carhartt workwear came to be popular among the likes of graffiti artists, MCs and other purveyors and associates of the streets. It didn’t take long for Carhartt workwear to find its way to the closets of rap stars. The Carhartt WIP brand was founded in 1994. Not just a reliable clothing label, WIP supports artists, musicians and riders. Carhatt WIP was involved in European skateboarding and BMX since its beginning. Carhartt’s grounded attitude garners respect from many - even those skeptical of the brand hype. Carhartt does their part in supporting local scenes and funding the upkeep of important skate parks. The Carhartt WIP skate team features some of the most famous European skaters: Vans and Element team rider Phil Zwijsen, Joe Gavin, Isle Skateboards’ Sylvain Tognelli, Antiz Skateboards team riders Julian Furones and Hugo Liard, along with almost half of the Polar Skate Co team - Pontus Alv, Jerome Campbell, Michal Juras, Aaron Herrington, David Stenström and even the Danish team rider and European Skater of the Year Hjalte Halberg - are a part of Carhartt WIP crew. OCTAGON is an independent video supported by Carhartt WIP. This dark, ominous skate video features tricks from the likes of Bram De Cleen, Joseph Biais, Valentin Bauer and Edouard Depaz. The video depicts a black and white world full of technological, futuristic references and concerns itself with topics like new technology, human subjugation, freedom and rebellion. This video is a uniquely dark, fascinating example of exactly how creative a skate video can be. Carhartt WIP: The Must Haves! The Titus Online Shop has tons of different Carhartt products. From clothing to accessories like backpacks, you'll find plenty in our Onlineshop. Their most popular item would have to be the Acrylic Watch Hat, aka the Carhartt Watch Beanie, which is easily the most famous Carhartt item of all time. Originally intended to keep workers heads’ warm, this beanie gained attention after being worn by the likes of Naughty by Nature and other rap groups. An all-time classic, yo! 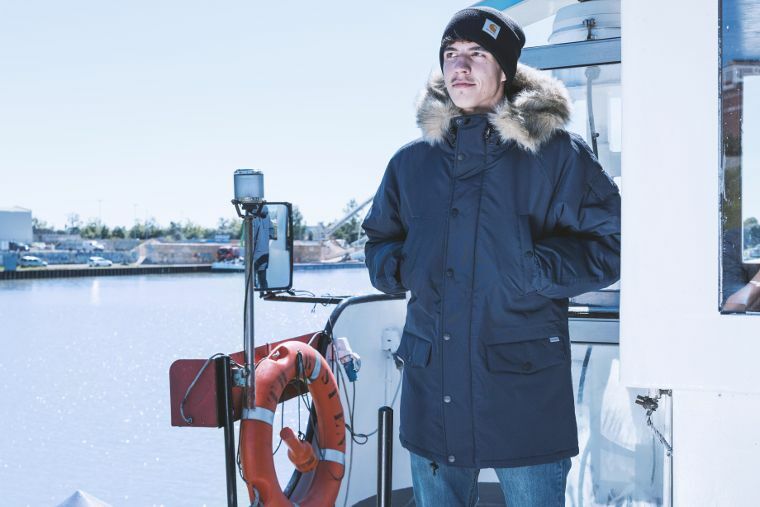 Another Carhartt masterpiece is the Carhartt Anchorage Parka. Its minimalistic look is particularly popular with rappers. Nas, Action Bronson, A$AP Rocky and both members of Mobb Deep all wear the Carhartt Anchorage Parka! Curious About a Specific Carhartt WIP Product? If you have questionsabout other Carhartt WIP products, contact our customer service via service chat, telephone or email. They can help you with stuff like sizes, silhouettes and shapes.